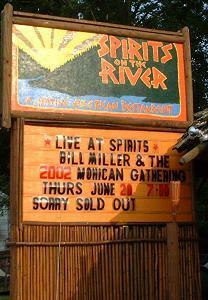 2003, unfortunately, had to be “postponed.” And, in 2004 the Gathering continued … the hits kept on coming! 1998 “We came from Indiana & Illinois. We came from Florida, Texas, California and Oregon. We came from North Carolina and the Alaskan frontier. We came from across the Atlantic. Some came only in Spirit. It didn’t matter, for WE came, and we could almost FEEL the presence of those who had wanted to. We came together without anyone making a profit. We came without really knowing WHO it was we were coming to meet. We came to the unknown. Why? Why would virtual strangers, most of whom knew each other ONLY through that intangible realm known as Cyberspace, send their money to who-knows-where for T-Shirts, CRP Packages & movie tickets, pack their bags, and drive, or FLY, to some non-existant place called MohicanLand? This is a question to ponder, much like “The meaning of life,” but we’ll save that for another time. We imagined a dream. We trusted one another. We put a plan together. We MADE it happen! The lure, the one common thread we knew we all shared, was “The Last of the Mohicans”, in its broadest sense. The mystique of that film, of that cast, of those mountains, of even the novel, and certainly, the history was strong enough to make us put aside any fears and turn an unruly mob of merry Posters into an Event we will long remember. So many, though, who helped to foster that dream, and many others who will stumble upon it after the fact, were not able to attend. And so, as the ever-diligent Program Guide Editors pointed out in the GREAT Program Guide (and, it WAS! ), we remember you, and dedicate this page to you (along with, of course, those who actually attended). It probably would never have happened without you! A mighty thanks to Rebecca, Victoria, Lynne, Joy, Neuromancer, Bill, Petra, Heather, Joe, She-Who-Tracks …, Norm, Carmen, Katja, Major Bray, Mike, Gretchen, Kathy, Georgette, Kiki, Juanita, Morwenna, and, of course, the illustrious Dr. Mary! (Did I forget anyone?) This Gathering is behind us now … It was a glorious time, but bittersweet, for it was SAD to have to say good-bye. You know? 1999 “Did you ever imagine this when you first started?” That question has been asked of us many times, regarding many different situations. The answer is always, “No.” From gaining inspiration from a movie, to tracking down the film’s locations, to laying out a guide booklet, to finally having it printed, to creating a web site through which to sell it, to seeing that web site expand far beyond our wildest dreams, to all the cast contacts, to all the fine contributions from people we had never before known, to watching as a real live virtual community sprung up before our eyes and called itself MohicanLand – the combined personality of which extends to The Gathering – to seeing the interactive part result, spontaneously, in a Great Mohican Gathering last year that was to become a lifelong memory for 38 lucky people … An amazing odyssey. It’s been creative, fun, challenging … and endearing. We have, with the love and support of so many of you, overcome huge obstacles placed in our path. We have laughed till we’ve cried & cried till we laughed. 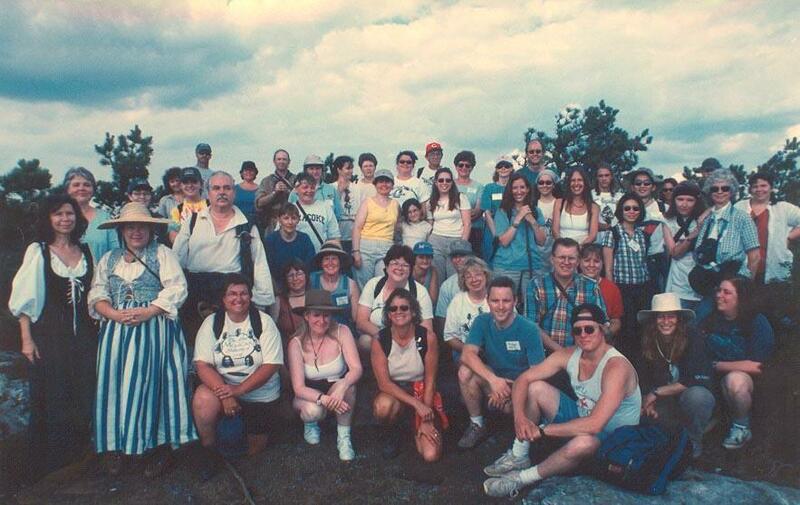 How could another Great Mohican Gathering, in 1999, be anything but a disappointment, a letdown … With the spontaneity gone, would it, COULD it, ever be a success? Or would the Trail finally run out? We could begin the telling of this tale in very much the same way the past two Gathering events were recounted. In fact, we could probably get away with using the same WORDS, practically verbatim … Ahhh, but that would be cheating! And, in fact, this Gathering, in the year 2000, was very much different from previous events. It would seem, that all three Gatherings to date have had their own unique personalities, despite the obvious similarities. The first one was new … and short. The second time around, we expanded to a third day, visited The River Walk, and had a very special guest in Eric Schweig. Then, the third rolled around. The second had been pulled off to near perfection. Could it be matched? Well, the sign up list grew … and grew … and despite a last week shuffling of attendees due to cancellations, near cancellations, and last-minute sign ons, the roster was at an all-time high. Amongst those putting The Gathering together, this was a cause of some trepidation. 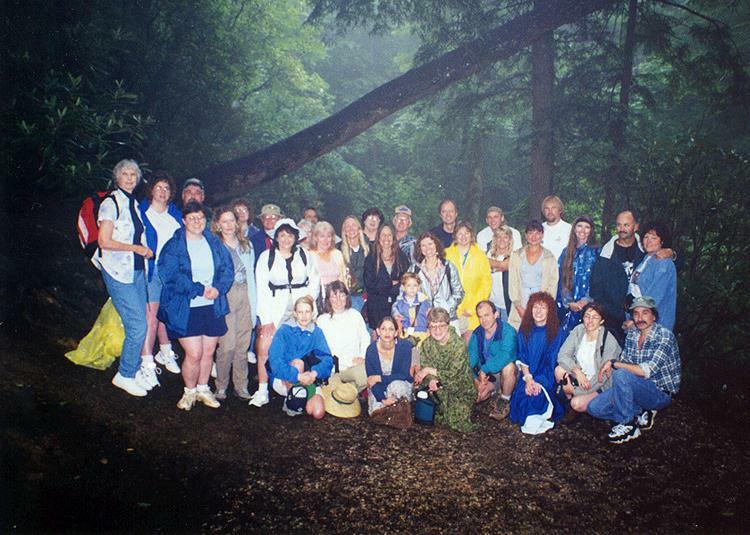 How in the world would we handle a group of 80, far surpassing either of the past two Gatherings – in fact, nearly equaling both of them COMBINED – on the trails that lead through Mohicanland? How would a 30 or 40 vehicle caravan ever stay together through the twists & turns of Mohicanland’s back roads? And then, even though there were many returnees from the previous groups, there were even MORE newcomers! Would we jell? Would the camaraderie & friendships; the good-humor & good-will still be center stage? Or, instead, would it simply deteriorate into a “tour” of film locations? Funny, I don’t remember THAT particular line … I’ll have to go back and check the script. The film rolls on … a father violently reaps his revenge. Yes, Chingachgook, father of Uncas, has caught up with the Huron war party and stands face to face with his adversary … Magua. A brief, but brutal, struggle ensues and Magua collapses, broken & dead, on the rock, as Hickory Nut Falls gushes by. His head smashes to the ground, blood gurgling at his mouth. The audience cheers. After all, he IS the villain! … And that’s the kind of Gathering this was! I felt very much like that as I planned & prepared for this Gathering. I wasn’t sure I was doing the right thing; wasn’t sure I even wanted to proceed. Yet, something kept driving me, and though I was looking forward to “getting it over with” more than anything else, I proceeded forward into what I felt was the unknown. 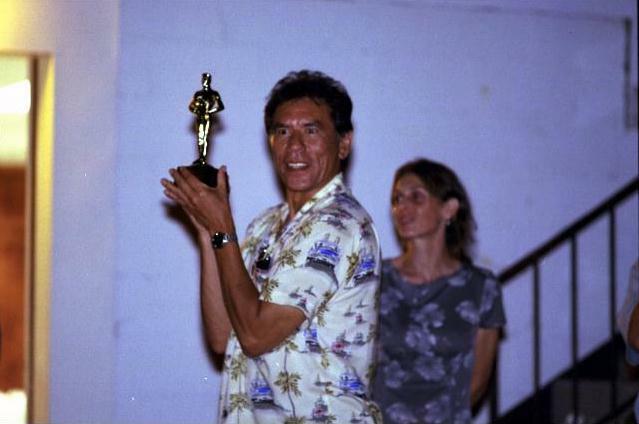 Certainly, I was looking forward to seeing some of the familiar faces I’ve come to know & love, and I definitely felt that I owed it to the “newbies” to show them a good time, but other parts of me felt it probably would have been better to just let it lay, with the Wes Studi-themed Gathering 4 the Grand Finale of it all! The events of September 11, 2001 also played a part … a large part … in the dismal outlook. It took months for me to somewhat shake the horrible feelings of that day and begin to feel like a Mohican Gathering might even remotely seem appropriate. 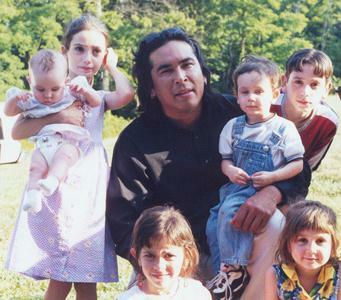 Those feelings aside, I believe that once committed, stay the course … and so the Great Mohican Gathering of 2002, with much assistance from fellow Mohicanites, was allowed to be born. So, I went on down to the Geneva, in Chimney Rock Village, on Wednesday evening, June 19, carrying with me much consternation, trepidation, a little hope, and a brand-new Gatherer, Ariel Segal who I had just picked up at the Greyhound terminal in Asheville. The hope began to swell, and the fears to subside, as we pulled into Hickory Nut Gorge on a early summer’s late afternoon. The sun drenched cliffs were a welcome, and invigorating sight, the familiar feel of The Gathering Place at the Geneva, filling with raffle items of all descriptions, not to mention folks I really cared about, all began to jell, beginning to create that special mix of Gathering magic that has been the Gathering’s trademark. Russell and I would like to express our appreciation to the Group for your gracious warm welcome at your annual gathering last month. We had a wonderful time. The bar-b-que was delicious, many thanks to those that organized and to all that gave us gifts, the bar-b-que sauce, Vermont syrup, apple butter, etc. etc. (and yes, Russell persuaded me [to] carry the left over short bread and ginger snaps on the plane home)! You can take the man off the rez, but you can’t take the rez out of the man! You are a great family. May the Great Mystery continue to guide and protect the paths of you and your loved ones. Previous Post: Who Done It?